Classic Executive Gift Box for the caramel and toffee lover.Contains an amazing assortment of 16 of our famous chocolate sea salt caramels, 8 chocolate caramel mixed nut clusters, 16 chocolate toffee pieces, and 6 chocolate "Snappers", our chocolate caramel pecan clusters. Available in milk chocolate, dark chocolate or assorted chocolate versions. Box secured with gold, red or silver stretch band ribbon. Makes a great food gift. Includes 4 color process label on clear box cover. 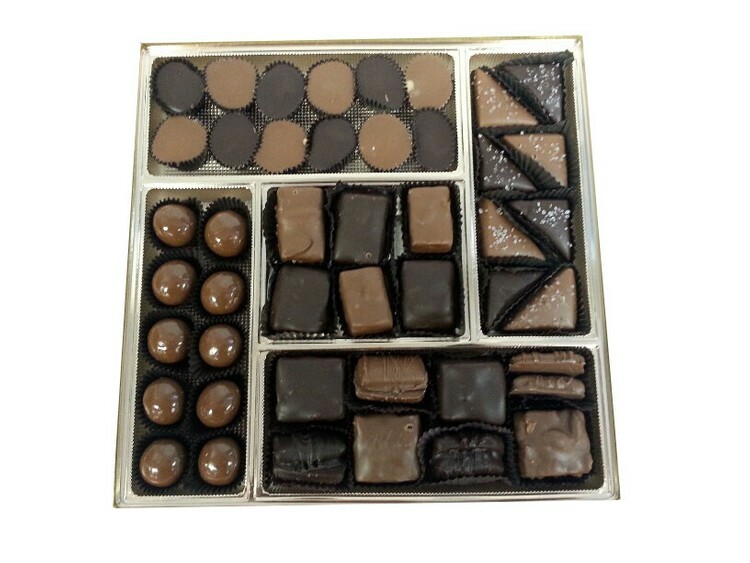 Available in: milk chocolate, dark chocolate or an assortment of milk and dark pieces.